Glasgow City overturned a 2-0 deficit against Poles Medyk Konin to reach the Uefa Women's Champions League last 16. Jo Love's drive put Glasgow ahead on the night and Susan Fairlie levelled the tie with 14 minutes remaining. Extra-time ensued and Denise O'Sullivan gave the Scottish champions a 3-2 aggregate win and knocked the Polish outfit out of the competition. Eddie Wolecki Black's side progress to face Swiss side Zurich Frauen, who beat Croatians Osijek 7-2 on aggregate. City faced an uphill task at the Excelsior Stadium after goals from Ewa Pajor and Aleksandra Sikora gave Konin victory in last week's first leg in Poland. But they started the second leg brightly. Suzanne Lappin fired over and also threatened with a header, although City also had defending to do with Nicola Docherty forced into a goal-line clearance. Eilish McSorley fired narrowly wide for the Scots, then lifted a free-kick over, before O'Sullivan and Fiona Brown both had efforts saved. City did finally get the breakthrough their play deserved when Love struck powerfully into the net early in the second half. Wolecki Black's side sensed an equaliser was on the cards and it came when Fairlie forced into the net. City pushed for a winner in regulation time but Brown could not keep her effort down, meaning an extra 30 minutes were required. 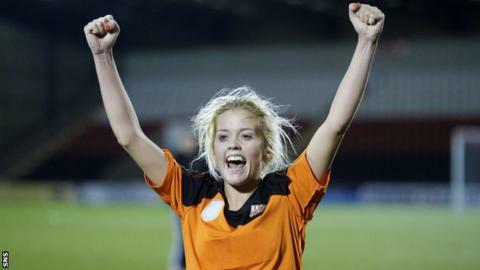 However, O'Sullivan ensured there would be no penalty shoot-out when she hit Glasgow's third five minutes into extra time.